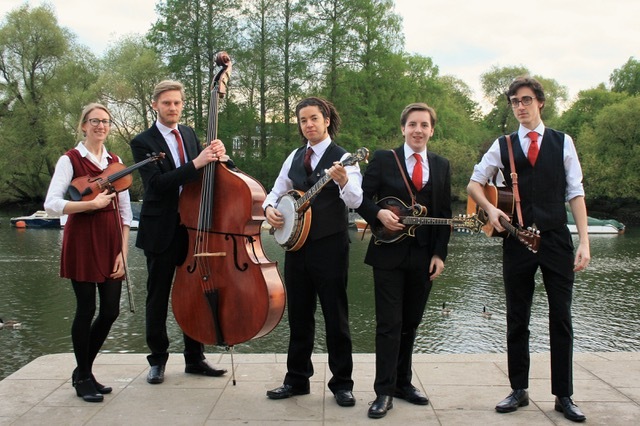 The Vanguards are a five-piece traditional bluegrass band based in London, consisting of Jack Baker on mandolin, Alex Clarke on guitar, Chris Lord on banjo, Laura Nailor on fiddle and Pete Thomas on bass. They take their musical inspiration from the originators of bluegrass music. Instrumentally, they seek to create a sound which blends the mandolin style of Bill Monroe, the banjo style of Ralph Stanley and the old-time style of fiddling which typified early bluegrass recordings and which continues to influence the sound of traditional bluegrass bands into the present day. When not playing their original numbers, their repertoire reflects these musical influences. Their choice of songs strongly favours those written or recorded by The Stanley Brothers and Ralph Stanley & The Clinch Mountain Boys, but they also feature several songs made popular by Bill Monroe & His Blue Grass Boys and Flatt & Scruggs. Their particular passion is exploring and faithfully recreating bluegrass music’s many rarely-heard compositions, particularly those written by Bill Monroe and Dr. Ralph Stanley.